A few months ago, there was a survey on our Facebook group about where the members were from. I thought that most of the members would be from the United States. Actually, the country with the most number of members in that group was India. 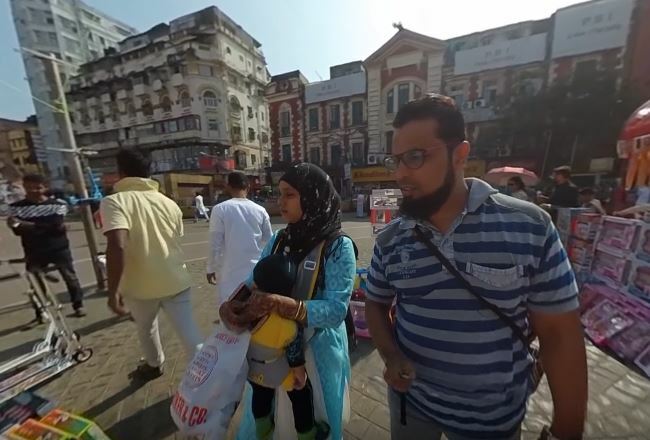 One passionate 360 shooter and 360 Rumors fan from India is Saud Ansari, who has a growing YouTube channel called LifeNFood. In this guest post, Saud shares some 360 photos and video and gives us an inside view of the state of 360 and VR in India. I am a technology enthusiast, and 360° camera and virtual reality have really made me think about the future. The most amazing thing is when you are on a VR headset and get immersed — you get a feeling of being at a different place, not just viewing the 360° content on mobile or PC. I really enjoy seeing everything around a place I want to go but cannot visit. It is really fun to be there at a location on street view and travel across. Imagine when you can be in a video with free hands and hugging your friends or when photo is being clicked. I believe 360 cameras are great for India, specially during wedding or festival season. Every time there is any festive or wedding there will be always someone or a moment was not captured everybody’s expression. 360° camera you can record video and don’t miss anyone, anytime. Imagine a small birthday party at home and keep the camera in its position and you can enjoy every moment with your dear one and also capture everyone’s expression or a wedding where everyone is running around it will capture everyone. Indian wedding video will be fun to capture every moment which cannot be captured by a standard video camera. Also you do not have to left out of the video or photo when you shoot it. We can also help build tourism for India , as people watch the complete location in 360° or specially VR, it will give an extra edge. You can also build up business if you are a hotel or restaurant, as people see how good is the environment and ambiance. If we start talking about 360° camera in India, people who are tech-freak like me may understand but most people will not. Though India may have good use for 360 cameras, they are still not commercialized yet. If we talk about camera in India, people will say that they use phone to click photos and video. Then there is a group where they use DSLR camera. Many people are not aware about 360 cameras or virtual reality. There are so many 360° cameras available worldwide but only few available on Indian e-commerce website. I believe this is because there is not yet much demand for it. I am on a mission to make India ready for 360° cameras and virtual reality for those who are not aware about it. I have started 360° video logs on my YouTube channel – LifeNFood and since then people who watch it specially my friends and others ask me every time which camera you are using, you need to shoot with camera at your face height and they are not able to see me in video. This made me realize that people are not aware how to view the 360° video or VR videos on mobile. I was surprised when few of my friends and relatives did not how to use the VR headsets or view 360° videos on mobile phone or even PC. Most VR headsets do not come with a remote, which can be problem for a new user. An even bigger issue is the content — India does not know where and how to access VR content. Even on YouTube, not many creators create VR or 360° content and which leads to low awareness about it. 360° or VR is still a niche but that should not be the case. I believe 360° and VR is the next big thing. I think once Oculus Go is launched by Facebook, things will change, as it will be independent from mobile. I want India to have more 360° content. I am writing scripts for it and waiting for it to execute the shoot. I hope that people will like it and share it, which will encourage me to create more content. But before I do that, I need to make people aware about how to use the VR headsets or view 360° videos on mobile phone or PC, which will be a bigger task than creating a content for it. I am aiming to create more virtual reality and 360° content for my viewers but I am just beginning and first step is to make people know about it, so with this article, I will be starting the journey of making people aware about the 360° and virtual reality in India. All my friends into virtual reality and 360° videos, you guys be a part of this journey and those who are reading this share it, subscribe to my YouTube channel – LifeNFood share it with more people.